The perfect bicycle headlight is somewhat elusive. You want to be seen by others, you want it bright to see what is ahead of you - regardless of speed, you want it on when you need it and off when you don't. You want it cheap and unobtrusive, and ideally, you want it powered by the movement of the bicycle. Well, you can't always get what you want - but if you try sometime, you get what you need. I'm going to focus primarily on lights for the road. Mountain bike riders riding in the woods have different issues to contend with. The problem with most bicycle headlights sold for use on the road, and I'm including some very well made and very expensive options, is that the beam pattern is basically round (in some cases oval). If you look at the low beams of your car while parked in front of a flat vertical surface you will notice that the light beam appears to be cut in half. The upper half is missing - which that is required by law. If the low beams had a full round beam pattern like high beams do, the light would blind oncoming traffic. The same is true for bicycle headlights. When aimed properly so you can see a reasonable distance in front of you, the stray light at the top of the beam pattern is blinding the other users of the road be they on foot, on bike or in a car. If fact, you are blinding them at precisely the moment that you least want them to be blinded - right when they are about to pass you. If the headlight has the same light output in all directions, the road close to you will get a lot more light than the road further away. And even if your light is powerful enough that the road 150 feet away gets lots of light, the road close to you will get even more light, resulting in contrast between close-up objects and objects farther away, making those distant objects less visible to your eyes. On quiet roads where there are usually no other sources of light, the only light you have is what you bring along, and perhaps what the moon provides. It often seems as though you're riding in a tunnel - the width of the tunnel determined by the width of your headlight's beam. The wider the beam, the wider the tunnel. With a narrow beam you need to pay close attention to what's going on around you, and tend to feel as though one false move will send you flying off the road. The faster you ride, the worse the feeling. With a wider beam, you can relax a bit more. But a wider beam requires more total light. Alternately, if you're riding in the city, you have plenty of light from other sources (overhead street lights, other vehicles etc...). You often don't need too much light in order to see where you're going, and you're more concerned with others seeing you. You need light on the road surface to see road debris and potholes, but you rarely need light in order to find your way. How do you measure the light coming out of a headlight so you can compare one headlight to another? I sell a variety of headlights here at the shop. Many of them are dynamo lights designed to be powered by a front hub dynamo. I sell dynamo lights from Busch & Mueller, Supernova and Schmidt. All are German companies making lights that comply with the StZVO regulations and are therefore designed for use on the road with beam patterns that are properly shielded (cut off) to prevent blinding oncoming traffic. 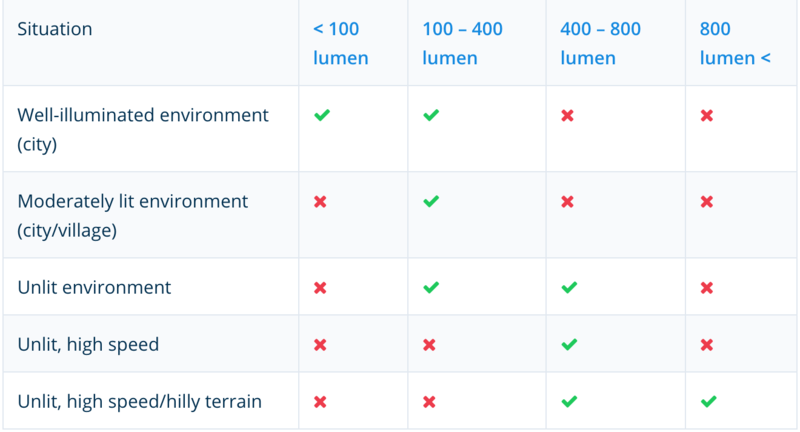 All of these lights are rated in terms of Lux ranging from 40 Lux on the low end to 150 Lux on the high end. For powering these lights, I sell dynamos from Shimano, Schmidt SON, and Shutter Precision. I am happy to build wheels for you around the dynamo of your choice and help you select the best light for your needs. I also sell battery powered lights of similar design to the dynamo lights which are designed to be used on electric bikes. The lights are connected into the bike's central battery system and operate within a range of voltages from 6 to 60 volts DC and usually require a minimum of 7.5 watts to operate. Some have on/off switches on the light unit itself and some must be switched by the controls on the bike. 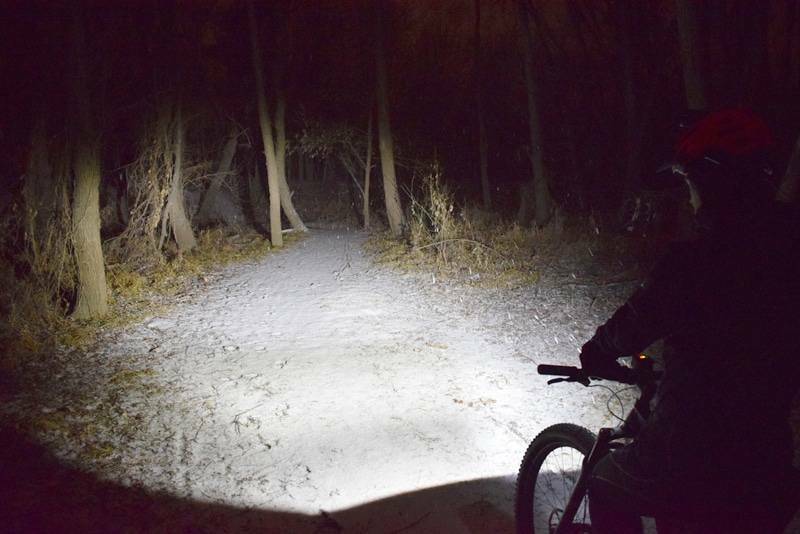 While e-bike lights share many of the same design elements as their dynamo powered counterparts, they are not interchangeable. Dynamo hubs provide alternating current (AC), while e-bike batteries provide direct current (DC). The two systems are NOT compatible. Lights designed for e-bike generally offer higher Lux ratings than their dynamo powered counterparts. Finally, I sell self contained battery powered lights. Most of these are simple units with round beam patterns and offer lumen ratings of 300 to 800 lumens. The stock battery headlight on a Brompton is the Cateye Volt 300 (300 Lumens). I also carry the Volt 400, Volt 700 and Volt 800 if you want brighter lights on your Brompton. Every year seams to bring more reported lumens and a variety of new features and designs but what doesn't seem to change is the beam patterns. These lights do not have a shielded beam pattern so you need to be careful in traffic with the brighter versions. For those of you that commute regularly, I sell an excellent lights made here in the USA by Outbound Lighting. This company is truly different. The founder of the company was a design engineer at a company designing automotive headlight systems. He wanted automotive type headlights for his bike but couldn't find anything he liked. 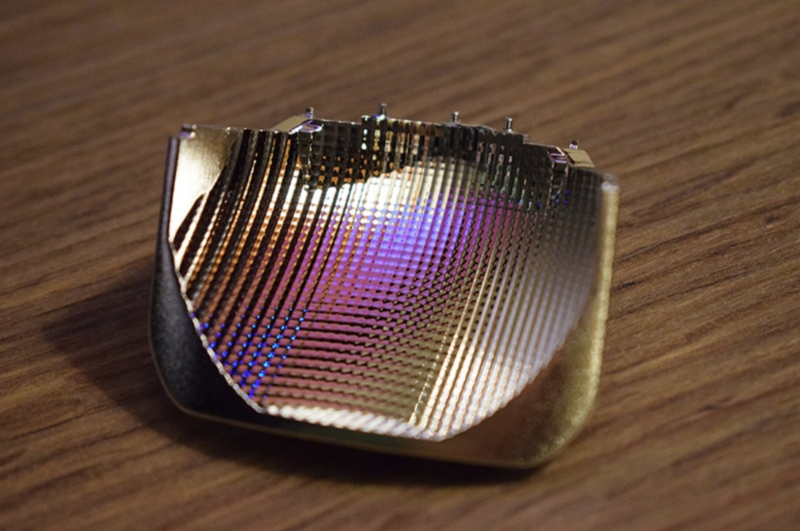 All he found was companies putting better and brighter light sources into the old bowl shaped reflectors. So he started a company to make something better. Using complex computer software and years of OEM automotive lighting experience he designed the Outbound Reflector Technology. This technology accurately places light exactly where it needs to be with 1,330 individual reflectors.